This week Yonatan started a whole new phase in the construction of his Stringed Quartet, called “graduating the thicknesses” ('spessori' in Italian). If arching meant carving the external shape of each instrument’s front and back, then now Yonatan started gauging the inside of each plate (two per each instrument, remember? ), taking out the wood until only an extremely thin layer remains, making the curvy, hollow shape of the violins, viola and cello. I don’t know if you know this (I didn’t…) but the thickness of the violin’s body is amazingly thin – only a few millimeters – meaning that towards the end of the process extreme caution needs to be taken not to accidently break though the thin wood that remains (I remember one of the students in Yonatan’s class back at IPIALL in Cremona did this once – gauged a hole straight through his violin’s back… What a bummer:)). This phase is hugely important as the thicknesses of the instrument’s plates (yes, thicknesses in plural – you’ll understand why next week:)) are maybe the major factor affecting its sound, resonance and playability. It’s also a phase that requires concentration and an ability to “understand wood” and will take the next couple of weeks. At least. So I was going to write all about it – but then LIFE happened, which meant that Yonatan ended up spending most of his time over the past two weeks working on something quite different. And that’s what I’ll write about this time. Usually, fine-tuning an instrument is done by – as violin-makers say – “playing with the setup”, which to us mortals means changing some aspects of the bridge, strings or sound-post (just as bit of trivia: the sound-post, interestingly enough, is called in Italian the instrument’s “anima” or “soul”, and the same in Hebrew “neshama“). 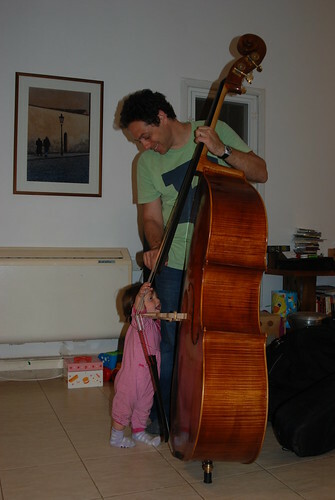 This time, however, Yonatan decided that a much more radical change was needed in order to reach the optimal sound and comfort from this beautiful double-bass. He decided to take its neck out, change some aspects of its measurements, and then insert it back in. If you think that’s an easy task – well, you’re wrong. Dead wrong. Anyway, Yonatan debated this decision for a long time, until finally he decided that bringing this double-bass to optimal performance was worth the effort, and he went ahead and did it! Now it’s time to send this “baby” out into the world of musicians, orchestras and jazz, and see who grabs it first! You can see more picture of the double-base here!. What a beautiful baby! And thanks for giving us the Hebrew name. I've come across many variations on the Hebrew word for "soul"--interesting how it's similar to "alma", the Italian name my luthier gave me. The double bass picture from the front is extremely beautiful. Every bit flows. It all looks balanced and just, Right.